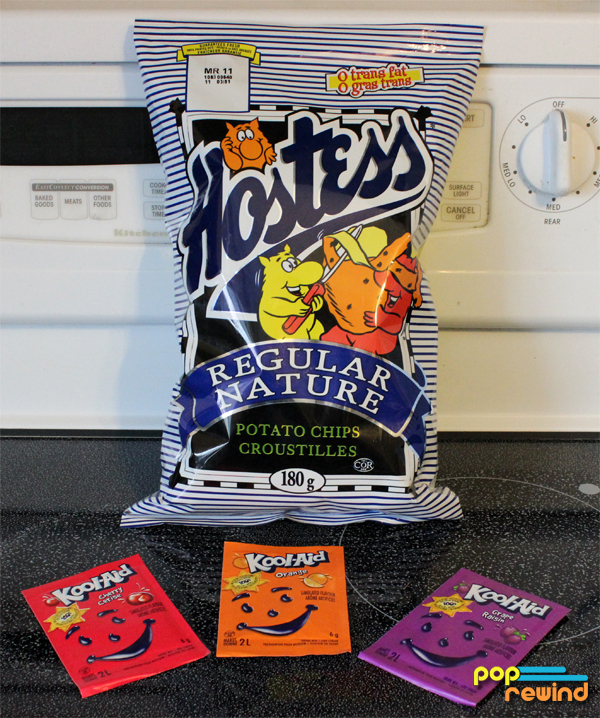 A few months ago, I wrote an “It Came From Canada” post about Hostess potato chips and came up with a shocking discovery—although Hostess was known for some revolutionary and out-of-the-ordinary potato chip flavors, they once tried to out-do themselves and market fruit-flavored chips. 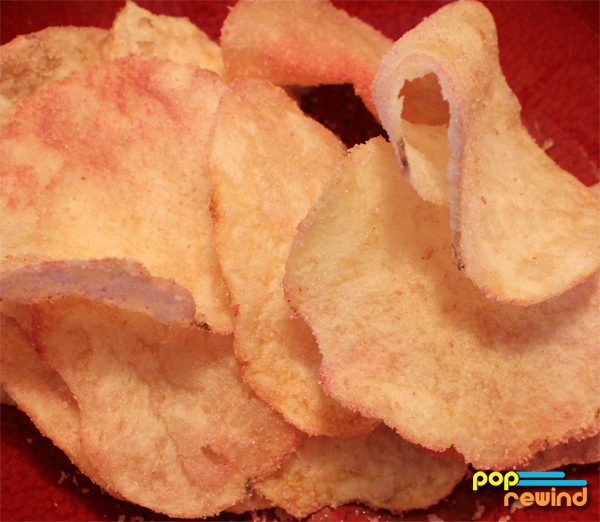 Not dehydrated fruit sliced into chip-like shapes, they weren’t pretending these things were healthy, far from it. I wonder what stickers came in the fruit-flavored chip bags? From delving into message boards, I found that Hostess came out with cherry, orange, and grape-flavored potato chips around 1978/1979. This was a short-lived experiment, lasting only a couple months before being pulled off shelves. 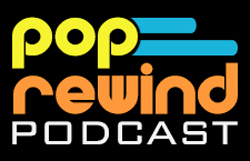 Reports indicate that they tasted like chips covered in Kool-Aid powder. Unable to think of anything but these bizarre chips for months, I finally decided to take action. I was going to recreate Hostess fruit-flavored potato chips. Because I hate myself. Hostess chips are difficult to find, unless you’re in Canada and have a Food Basics grocery store nearby. Well, as long as you have three in the city and the first two don’t have any so you have to go to the gross one in the bad part of town and then BAM SO MANY HOSTESS CHIPS. It was worth almost getting stabbed in the parking lot. Are Kool-Aid points not a thing anymore? Or did my ghetto grocery store get some weird knock-off Canadian Kool-Aid? 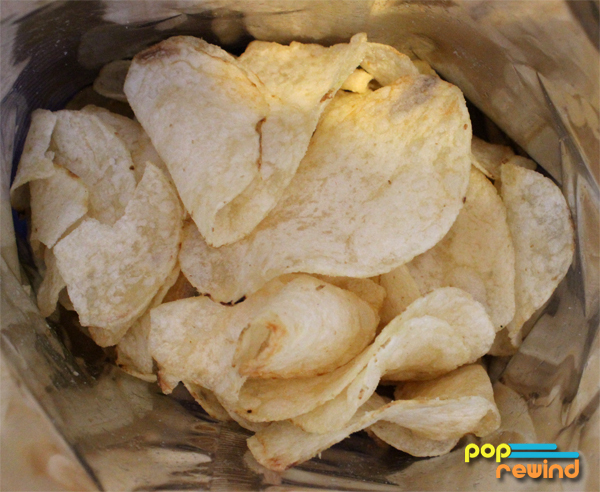 For the uninitiated—here’s what potato chips look like before some weird Canadian company starts making them into weird fruit flavors. Sadly, my bag didn’t come with Collectible Short Circuit Stickers. No more putting this off– it was time to get to work. My method of evenly distributing flavor to the chips included pouring some chips into a freezer bag, adding a bit of the Kool-Aid powder, sealing the bag (this is important), and shaking. The potato chip grease provided a nice adhesive for the powder. Starting from what I assumed to be the least offensive and working our way up to the most offensive, we have Cherry, Orange, and Grape. I had a glass of water nearby so I could cleanse my palate after each sampling. 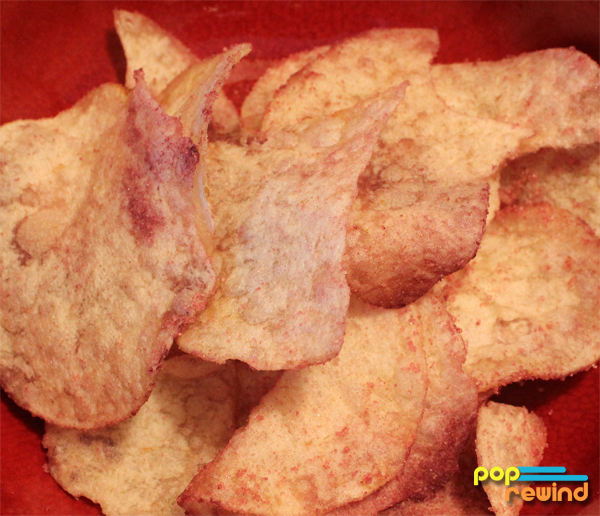 Hostess Cherry Potato Chips: Don’t let the above photo fool you, these were no ketchup chips. As the chip enters my mouth, it immediately fills with that type of saliva you get when you’re about to vomit. This continues throughout the duration of the taste testing. This was not a good idea. Hostess Orange Potato Chips: Not as offensive as Cherry, but the potato chip and orange flavors clearly do not go together. Not entirely bad, but not something I would ever willingly eat again. I still want to throw up. Hostess Grape Potato Chips: NO. JUST NO. These taste even worse than they look. The lingering taste of sour grape and greasy chips leave me wondering if Hostess had no quality control in the 1970s. Did no one bother tasting these things before shipping them out? I would guess no, no they did not. Prognosis: I really should have just purchased a bag of ketchup chips instead. One rumored fruit-flavored chip remains but it was unreleased and no one can confirm what it tasted like: Apple-Cinnamon. If Kool-Aid produced an Apple-Cinnamon variety, I would have jumped aboard. For science. 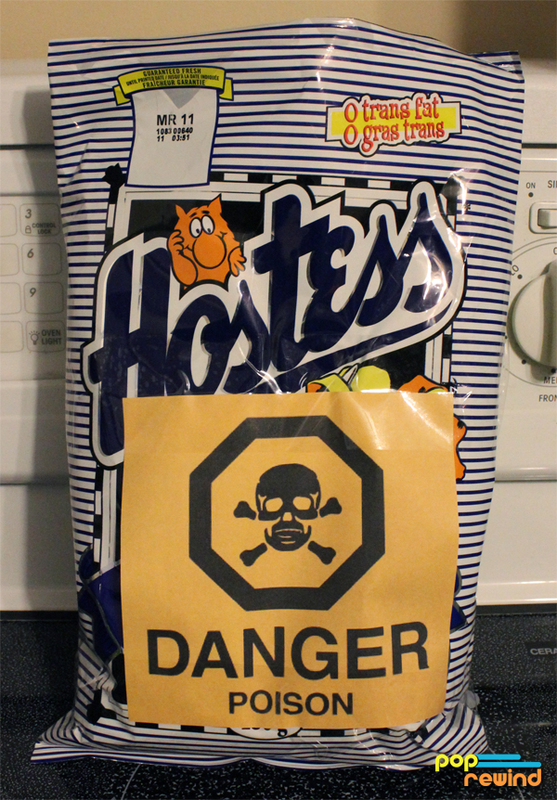 I would have loved to drag up some of the old original packaging for these fruit-flavored chips, but alas, Hostess has burned all evidence of it. This reasonable facsimile will have to do. Have you tried Hostess fruit-flavored chips? Would you be willing to do such a thing? 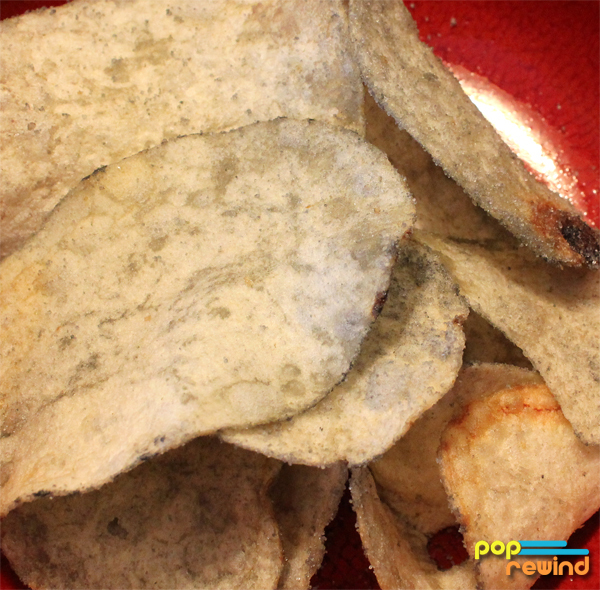 What’s the weirdest chip flavor you’ve tried? Leave us a comment! The original “fruit” flavours were not that bad, the grape was actually my favourite. The “Fruit” flavours were not that bad… and the grape was actually my favourite.